If you’d rather be on the bike than watching a computer screen, you can very easily turn this cycle ride around Corio Bay into a real bike ride. The ride from Point Henry to Limeburner’s Lagoon is around 29km, making the round trip nearly 60km, or a good day’s ride. If you start at Point Henry, ride along Point Henry Road to Portarlington Road. Turn Right (towards Geelong). Ride along the Portarlington-Geelong Road to Boundary Road and cross over the Portarlington-Geelong Road at the pedestrian lights to take the new bike path link to Limeburners Road. However, you might prefer to start your ride in the central area. 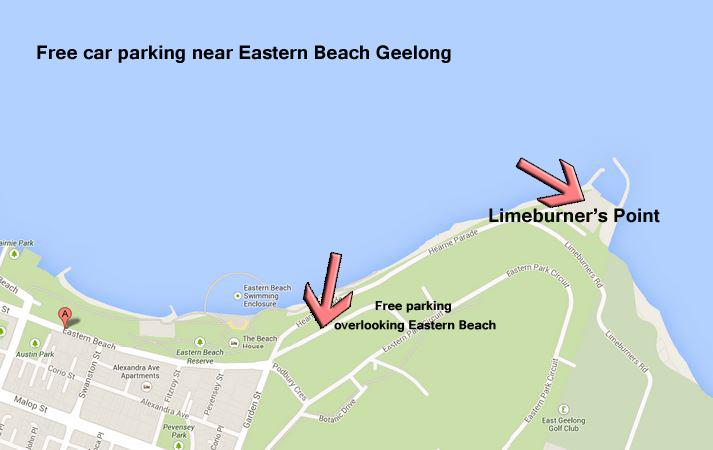 If you are coming to Geelong by car, park in the free car park in Eastern Park above Eastern Beach or at Limeburner’s Point. 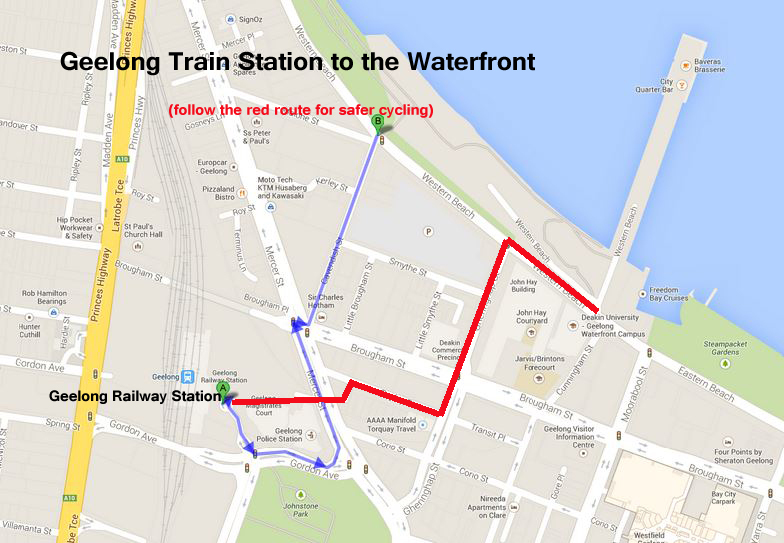 The waterfront is a five minute ride from the Geelong Railway Station. To cycle the whole ride, starting near the central waterfront area, first travel to Point Henry (best done while you are fresh as there are no coffee shops on this section). Follow the bayside route around Eastern Park to Portarlington Road. Turn left. Cycle past wetlands to the left turn to Point Henry (traffic lights). Proceed past salt pans to the point, enjoy the ambiance, and retrace your route back to the waterfront. This section is around 24 km return. For refreshments, there are numerous coffee shops and restaurants along the waterfront, from Eastern Beach to the city, and a restaurant (and, often, an ice-cream van) at Rippleside Park. This photo is taken at The Edge opposite the Carousel and Cunningham Pier. If the carousel is operating, you might like to take a spin before you continue your ride northwards. Click image to animate. The northern part of your route follows the bay on bike paths to Rippleside Park. Ride through the park and along roads to St Helen’s Park and beyond. Clicking this map will take you to a detailed map of the entire bike ride. You can, of course shorten the route as you desire, or lengthen it to cycle (and walk) the whole way to Point Lillias. You may prefer this ‘Around the Bay in a Day’ to the other, more gruelling, event. This ride can easily be undertaken after dark. The lights of the bay make a wonderful backdrop. The section of the ride between Limeburner’s Point and Rippleside Park can be undertaken completely on bike paths. Local cycling clubs often organise full moon rides. As the central business district of Geelong faces east across Corio Bay, cyclists can watch the full moon rise in the early evening. In fact, any time of day or night the shores of Corio Bay make for wonderful cycling. For the latest news about cycling round Corio Bay, or in other areas of Geelong, go to What’s New. In this episode, Cycling Geelong’s heritage ride from Queenscliff to Point Lonsdale is featured.